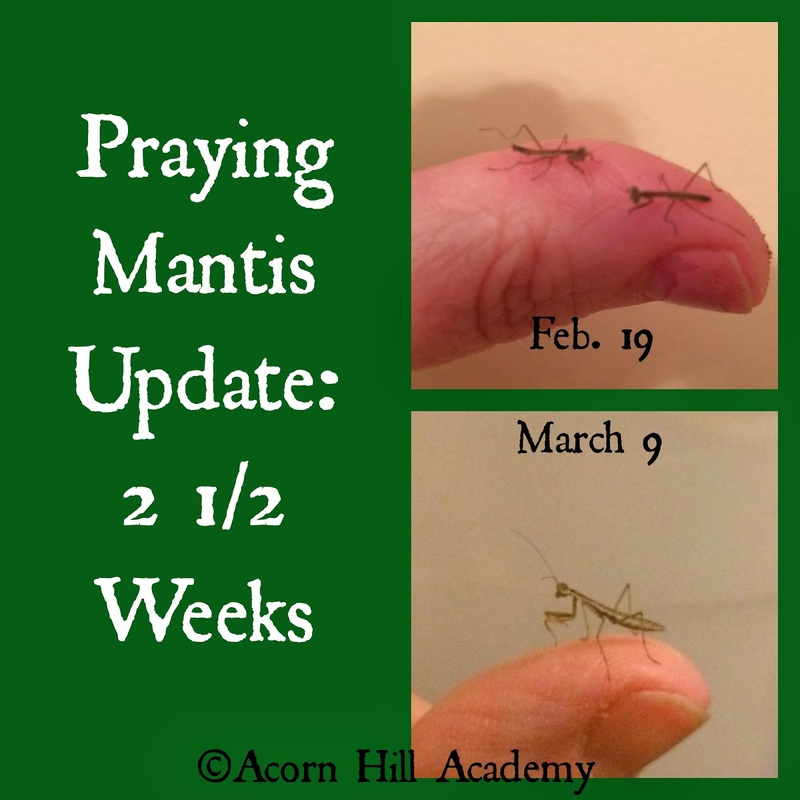 Well, we're down to three surviving mantis babies from our first egg case. I'm not quite sure what happened, except that perhaps I didn't get them the right food quickly enough. I had been feeding them ground beef, but read that it didn't have enough chitin in it, which is apparently something insects need. I started looking for alternatives, and the recommendations I found online were that we use either pinhead crickets or flightless fruit flies. Isaac and I drove to an exotic pet store, hoping they'd have something, but all they could offer were mealworms - which are, frankly, disgusting, and far too big for the mantis babies. They told me to go to Petco and get flightless fruit flies. When we got to Petco and inspected the flies, I observed that while they cannot fly, they do JUMP, much like fleas. I decided to try "extra small" crickets, in the hope that the mantises could handle those. Alas, it was not to be. While the crickets were shorter in length than the mantis babies, they were much wider. Most of the little mantids were afraid of the crickets, and the one I did see try to catch one was unable to do so because the cricket was just too wide for it to grab with its little hooks. Back to Petco I went for the fruit flies. At that point, we had separated as many babies as we could into individual pint and jelly jars, because the population was decreasing steadily as the carnivorous little beasties ate each other. It is quite a trick trying to get fruit flies into small jars. There are always escapees, and there are several out and about in my house now. Unfortunately, even though we'd finally found a good source of food for them, the remaining little mantids kept dying off. At this point, we have one left in a jelly jar, and two left in our butterfly enclosure. The three remaining ones seem to be doing well. We take each one out now and then, and talk to it, and let it climb around on us for some extra exercise. They really are cute. We still have two more egg cases, so if they hatch, at least we have food ready for them. It's been a good lesson in why God would have so many would hatch at once, because their little lives are so fragile, you need lots of them so that at least a few have a chance to survive until adulthood. We were hoping to raise one for each of us, but now I will be thrilled if even one of them lives to be an adult!